Home CA Entertainment New Book, ‘Axe the Taxes’ Might Help You Pay for Your Big Christmas! New Book, ‘Axe the Taxes’ Might Help You Pay for Your Big Christmas! RIVERSIDE, Calif. /California Newswire/ — Author Marvin Lee Robey announces the release of his latest book, “Axe the Taxes.” Mr. Robey says “Axe the Taxes” is based on Supreme Court cases dealing with taxes and quotes those Supreme Court rulings. The reason for the Supreme Court’s rejection was that the income tax is an excise tax which is only on special privileges that must be applied for, but it was being treated as a direct tax on all money received. It is very interesting that millions have been spent on repealing the 16th Amendment based upon our slang interpretations, when a simple look at what the Supreme Court has already ruled would have revealed their cause has already passed the Supreme Court! Title 26, the income tax code, is only for taxes in the U.S. Territories and taxes on privileges. The income tax law is an excise tax on special privileges only, in the U.S. Territories only, and on government employees, unless the IRS can get a voluntary agreement to pay the tax. “Axe the Taxes” offers forms for properly reporting non-taxable income from different sources. This completely eliminates withholding and 1099 income taxes for most people. “This is easier than filling out a 1040 short form,” Robey explained. “I have used this system since 1996 and have paid only taxes on Social Security which is a government privilege and therefore taxable. I have not paid anything on wages or 1099 income since 1996. I have had no problem and in fact the IRS told me when I once left out something and what it was. I added it and returned it immediately and I have not heard from them since. The IRS has been completely cooperative with me in this,” Robey said. “Axe the Taxes” is not another tax rebellion movement. It is all based upon proper law, already acceptable to the IRS. It does not promote any change in the laws or Constitutional amendments. The law is already on the side of the common people if read with proper legal language instead of common slang. “Axe the Taxes” provides pages of the legal definitions of the critical words from Title 26, the income tax code. “The tax codes must be read in their proper legal language which is often quite different from our common slang meaning,” Robey explained. 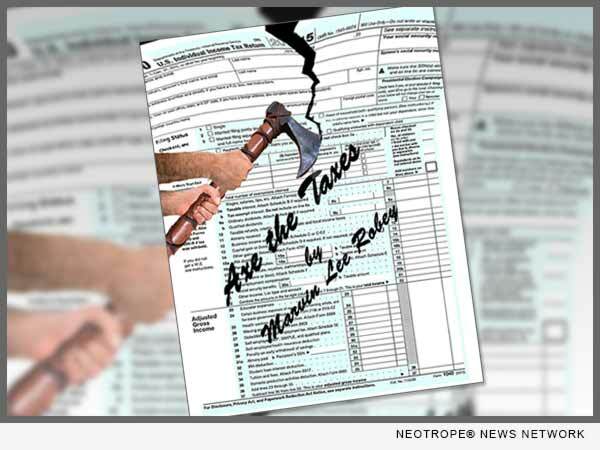 “Axe The Taxes” is sold only through the web site at http://www.axethetaxes.net/.